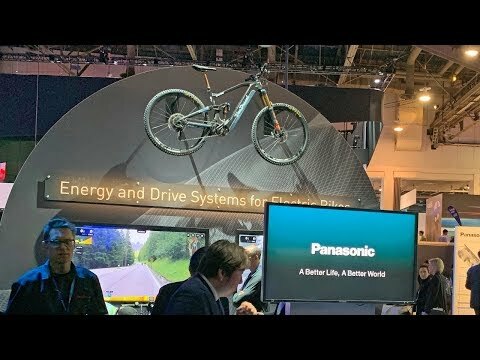 Van Dessel Cycles was presenting at CES 2019, I got to speak with the founder and president Edwin Bull as well as the VP of sales and development Rob Venderveur. The Passepartout uses an external battery pack that comes in two sizes (high and low capacity). It’s easily removable and tips out to the left. Edwin suggested that it could offer up to 75 miles of range per charge when using the 36 volt 12 amp hour battery pack. Van Dessel was founded in 1999 and the name comes from the founder’s mother’s maiden name (her last name before marriage). The founder, Edwin, has been a bike racer who began making his own frames at age 15. The company is based in New Jersey. Edwin said that the Panasonic failure rate is only 0.3% which is super low. He did a demo ride using a virtual trainer called the Wahoo Trainer. I noticed that the display has four levels that begin with Auto, which offers 30% to 300% output (similar to the Bosch CX drive system with eMTB mode). The Panasonic motor seemed smooth and fairly quiet (there was still some electronic whirring but not as high pitched as some competing systems). The motor itself is fairly compact… I was told that they were working on a carbon fiber cover possibly and reinforcing the fork as well as adding bottle cage bosses to it (for the gravel grinder Passepartout). Apparently they are working on a removable LCD display for the final build. The bikes will come in a full size run and two builds with different spec components. A Univega commuter electric bike was also on display at the Van Dessel booth because it’s a sister company. These models were built around the Panasonic XO mid-drive motors with 80 newton meters of torque.